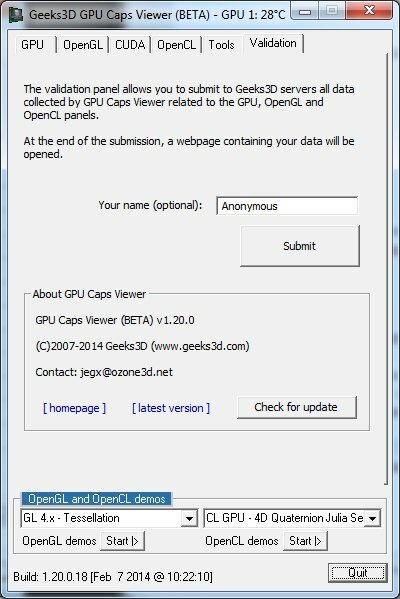 This is a test build version of GPU Caps Viewer that includes a new validation/submission panel to send your graphics hardware data to a brand new GPU database with detailed OpenGL and OpenCL information (extensions, capabilities). The GPU database can be found HERE. Thanks tapcio. I will look at this issue. 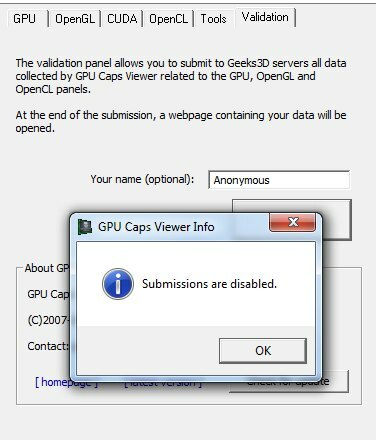 JeGX, Nvidia Maxwell GM107 is launching soon, can you please add GM107 detection & Compute Capability detection for Maxwell GPUs? Curious to see if Maxwell is Compute Capability 5.0 as hinted here. Also CC 3.2 has been removed, instead CC 3.7 appears. I guess that’s the CC of “Aries” or “Mary-Kate” and “Ashley”.